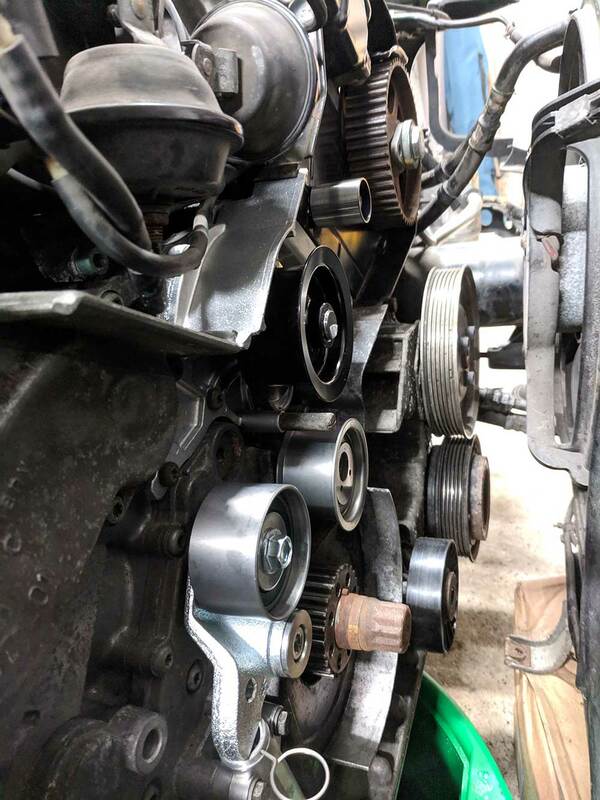 In the last article, we went over the teardown procedures needed to accomplish a timing belt, water pump, and thermostat removal. This time we will be going over the replacement procedure and the 500,000 different torque values you need to know (not really). Be aware that some of these will be in in./lbs. First thing you want to do here is get the roller pulleys, eccentric pulley, and hydraulic tensioner bolted down. All of these in the assembly will be torqued to 18 ft. lbs. 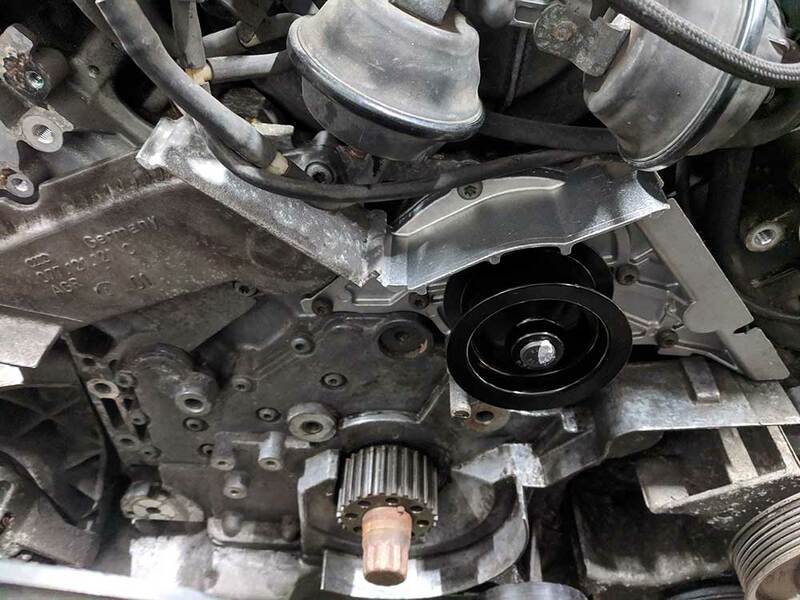 Do not tighten down the camshaft pulleys or the eccentric pulley yet as there is a procedure for that portion during the tightening of the belt. 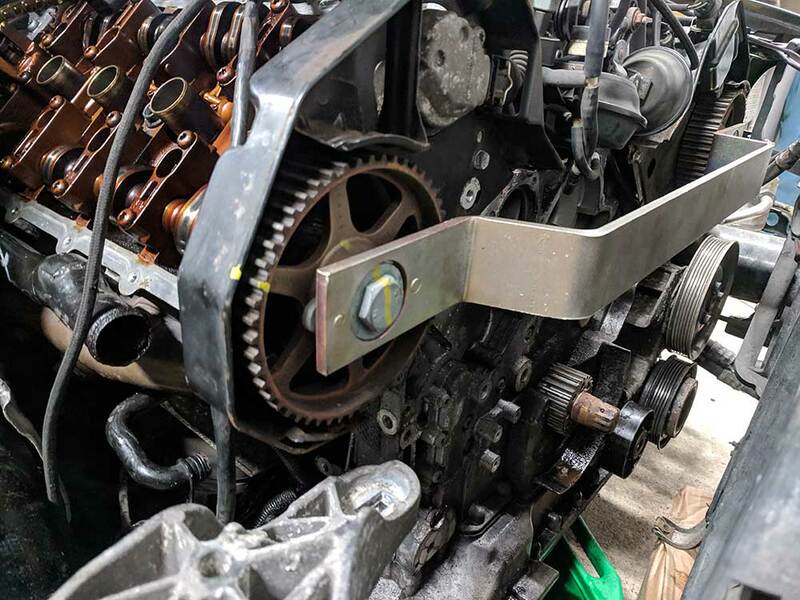 Start routing your new timing belt starting at the crank and working counter-clockwise around the assembly. Because this belt has teeth to keep in time, the goal is to keep tight throughout the routing. It will be slack at the end when you cross over the hydraulic tensioner. Once the belt is routed, you can install the crankshaft harmonic balancer pulley (also 18 ft. lbs.). This is where it gets weird. Double check that both camshafts are at TDC and use the cam position holder (special tool T4005) to hold in place. Once sure everything is aligned, place a 5MM hex key between the dampener and the pulley assembly. This determines the middle tension that the belt assembly must have during operation…IT’S IMPORTANT! DO NOT PULL THE TENSIONER PIN YET! You now need to put you attention to the eccentric pulley and using tool T4009 (two prong with 3/8 hole for torque wrench) put 53 in. lbs (6NM) tension on the pulley before tightening it down. The belt should be taught across the assembly. You can now remove the hex key and pull the pin from the hydraulic assembly to allow the belt to come under proper tension. 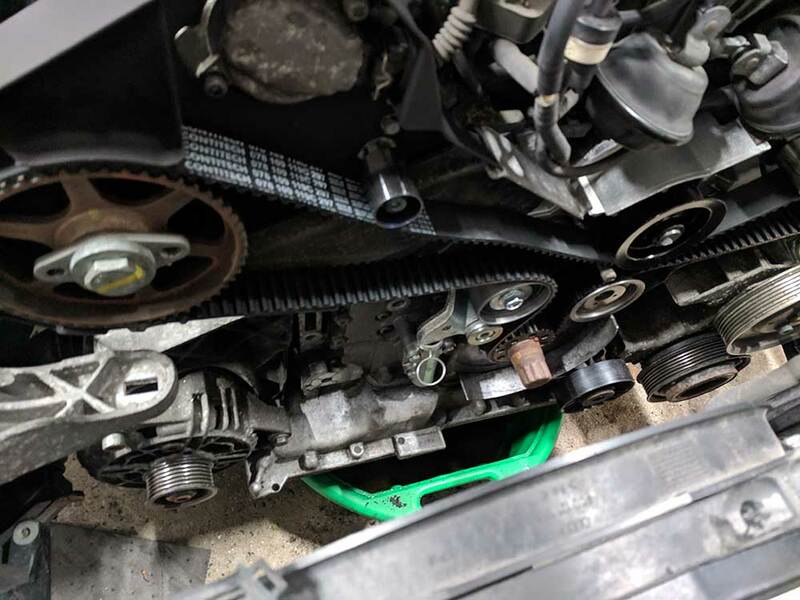 Side note…allow 6 hours at a minimum to start the car as this hydraulic tensioner takes some time for the oil to stabilize at the new position after being pinned from the assembly line at production. You now want to tighten down the camshaft sprocket bolts to 41 ft. lbs. They move freely during assembly and belt routing to allow proper tensioning of the belt. 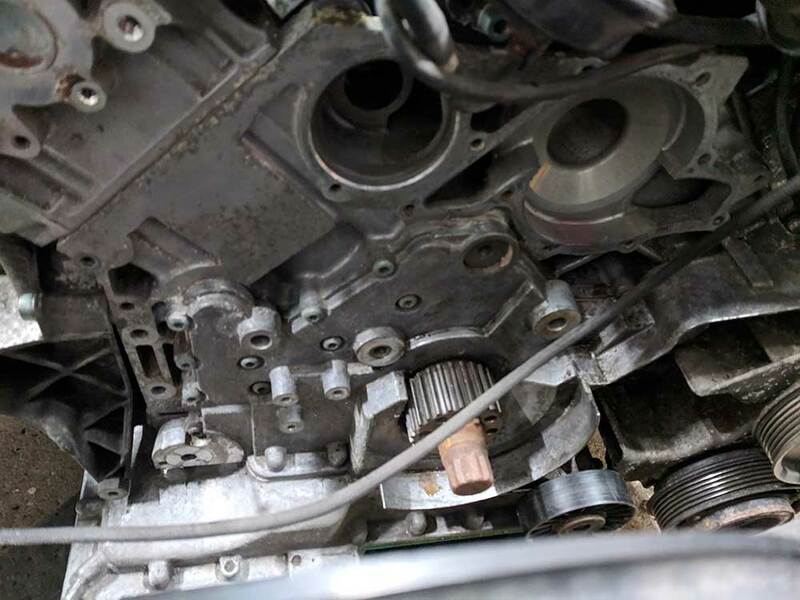 IMPORTANT STEP: Remove the crankshaft pin tool that you installed before removing everything. Place the plug back in the block. You now need to turn the engine over by hand for two revolutions to recheck that your cams and crank are synchronized at TDC. I honestly did mine four revolutions and checked every two just to make sure. If things do not align, you need to re-pin the crank and start at the beginning of realigning everything. 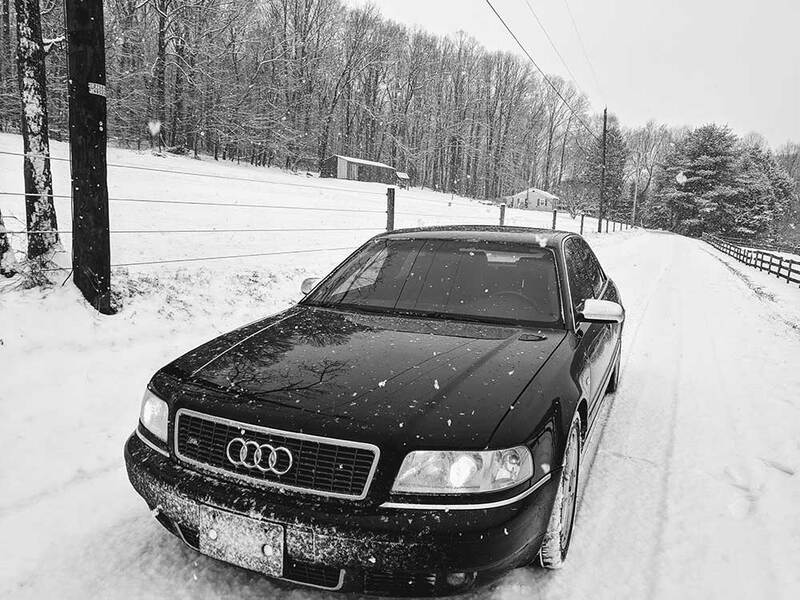 DO NOT START THE CAR UNTIL YOU ARE SURE. From this point, things are easy. 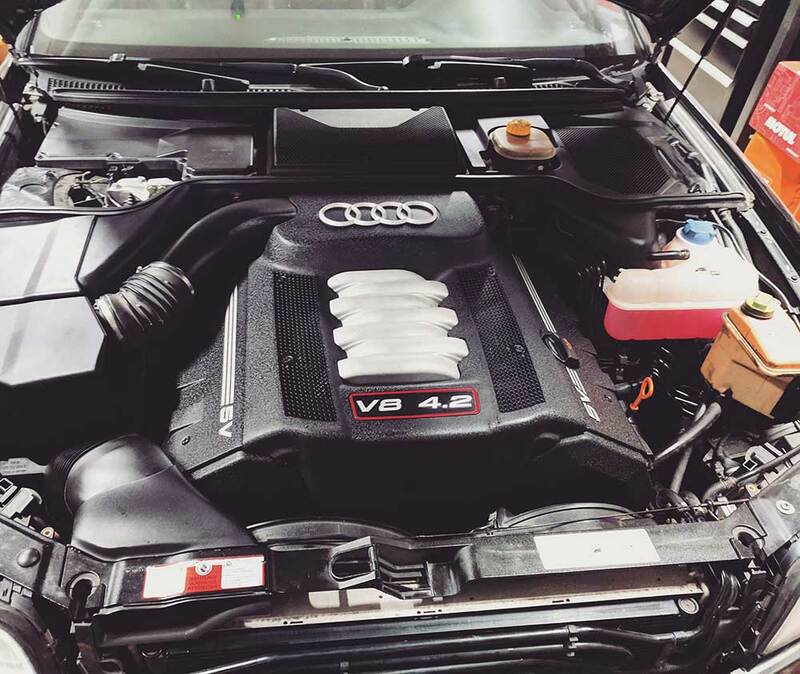 Replace the valve covers after replacing the Audi 4.2 valve cover gaskets (known issue point for leaks) and tighten down to prevent anything from getting inside the engine while exposed. Take everything that you took out during the teardown and replace in true Haynes manual fashion (Installation is opposite of removal). 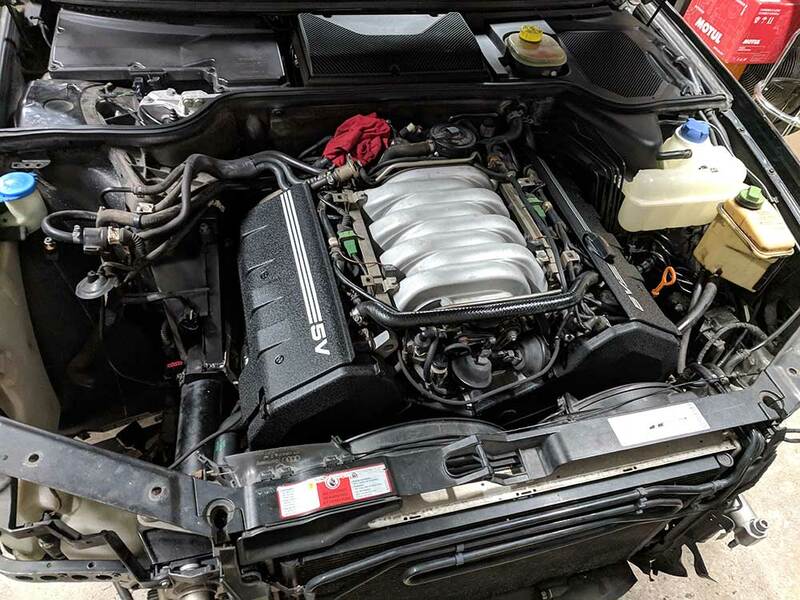 Before you start the engine, check over and ensure everything is connected electrically and no ignition coil, sensor, or vacuum line is left unplugged. The moment of truth is the nerve racking initial cranking of the motor. If anything sounds off, turn the car off immediately. Everything should be fine if you followed the steps, but sometimes, you may have missed something. As this is a daunting job, take your time and double check all of your work. You do that and you will be fine.